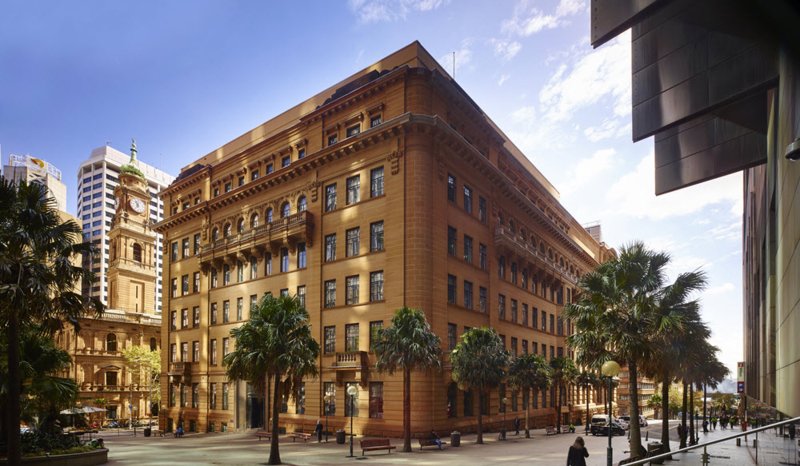 Earlier this year a design for the reinvention of one of Sydney CBD’s historic precincts was announced, unveiling the plans for the refurbishment and development of two existing sandstone buildings on Bridge Street. The two properties are the Department of Lands Building and the Department of Education Building. Completed in 1893 and 1915 respectively, these buildings are icons of the streetscape. Both are recorded in the State Heritage Register, Register of the National Estate and are protected by a Permanent Conservation Order. The conditions that come with properties on these registers makes a change of use and extension a substantial undertaking as strict conservation regulations must be adhered to. Renowned luxury hotel developers Pontic Land Group and Government Property NSW have come together to develop a flagship hotel from these administrative offices. The refurbishment and change of use is going to result in these sandstone structures being accessible to visitors, tourists, and locals for the first time in decades. The Education Building will predominantly serve as a hotel with 192 rooms planned but will also contain a mixture of bars, restaurants, function rooms and an open courtyard on the Ground Level. The plan for the Lands Building boasts an even more diverse mix of parts of retail, restaurant, hotel, function spaces and lifts to a viewing gallery in the clock tower and a rooftop terrace. The plans will also include an internal thoroughfare, which will provide the public with the unique chance of viewing the inner beauty of these architectural icons. The range of classifications incorporated within this design presents a challenge for Fire Safety Engineering. On one hand, there is the mixed-use development of retail, public, commercial and hotel parts to consider, with occupant demographics varying throughout. On the other is the architectural and historical significance of a heritage building, where practical solutions must be adopted to ensure there is no negative impact on the narrative of the property. Due to the requirements of the State Heritage act performance based alternative solutions must be implemented to ensure the preservation of the existing buildings on this project. With buildings of prominence, it is particularly important to consider the needs of the community while endeavouring to meet the desires of the design team, owners, and regulatory authorities. The history of a population and its development is a valuable thing to preserve for current and future generations. The fact that this restoration also gives the community and tourists the opportunity to interact with and enjoy the buildings makes this an inspiring venture. As the first design phases kick off we are excited to be a part of a team developing the legacy of these buildings. This is the perfect example of why Australia introduced a performance base code in 1996 – square pegs don’t fit in round holes – instead through fire engineering we create new opportunities and the result being a perfect marriage between the old and new! Thank you to the bold vision of Pontiac and Make for allowing us mere mortals to rewrite history.